Keep your Bench Cookie Work Grippers and accessories neatly organized and within easy reach wherever you use them most! The Bench Cookie Storage Center is specifically designed to organize and store the contents of the Bench Cookie Master Set (#56071, sold separately), but it's also useful for any Bench Cookie user. 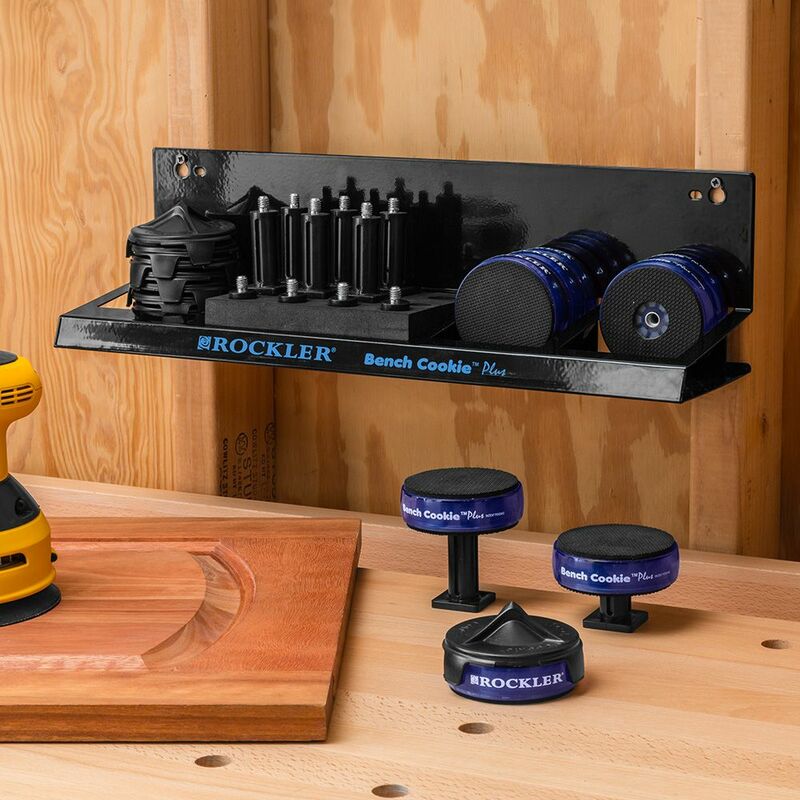 The storage rack is easy to mount wherever you commonly use your Bench Cookie accessories, whether that be on a shop wall, your workbench, or on an 18'' deep Rockler Shop Stand. It is made of durable black powder-coated steel with two pieces of high-density foam to hold things in place. 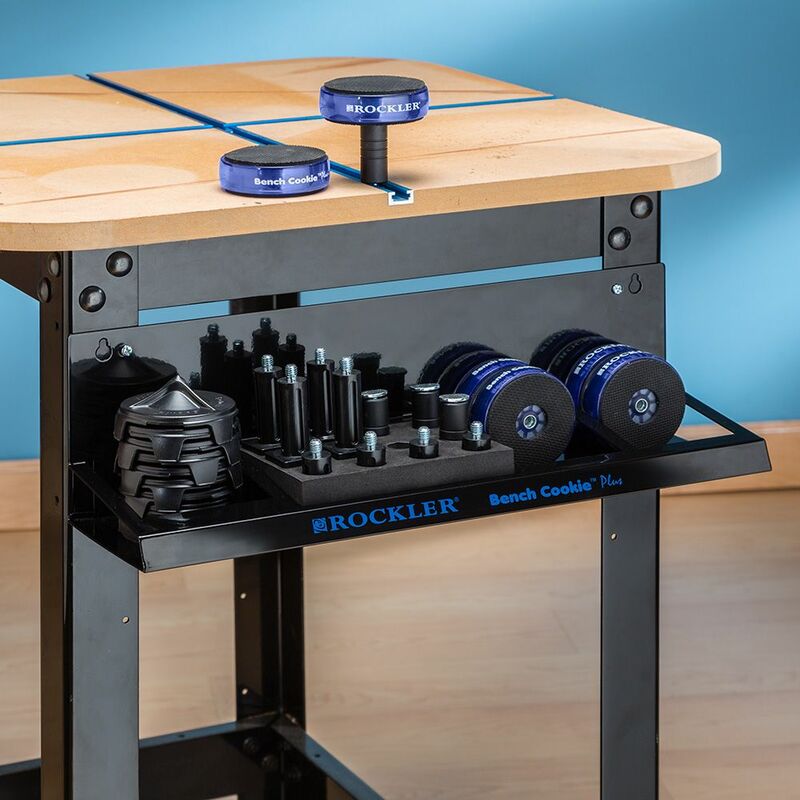 Your Bench Cookie Cones or Bridges straddle the circular foam pad, while holes in the 6'' x 4'' pad accept up to twelve Risers, in either the XL or Standard size. The two stalls on the right of the rack, can hold up to eight Bench Cookie Work Grippers combined. Keyhole slots at 16'' on center let you mount the rack directly to a wall or workbench, and a second set of slots let you attach it to our 18'' deep shop stands. I would highly recommend these to keep organized. Great Addition to the set !!! This is way overdue. It will be great to be able to get what you need instead of looking through a drawer for scattered parts. With the rack everything is in order and neat...... Thanks Tom M.
They are awesome! Just did a project finishing some black maple- bench cookie set was a huge help! There's not much to say other than it does what it was designed to do. I mount it on the side of my workbench and all my bench cookies and risers are in one place. Great accessory for the bench cookies. I mounted it on the wall under a cabinet so it is out of the way but easy to access. A great storage option. Organized storage is always good. Works great as a compact storage for bench cookies kit. Mounts on wall easily if desired. Bought them as gifts along with the bench cookies. Everyone was pleased with everything. I would strongly recommend both products. As described, this is a convenient way to keep these items handy. It does what it's designed to do...that's about as detailed as this needs to get. Well designed storage for bench cookie items. This handy little rack is perfect to store the cookies and posts in. I hung it at the end of my workbench so they are close at hand and organized. The item was on sale and a really good price. 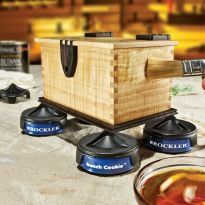 A heavy gauge black powder coated product with dense foam inserts holds just about all of my Rockler Bench Cookies and accessories. Very well made, durable, sturdy, and built to proper dimensions. I highly recommend this product and am going to purchase a second one. It works just as stated. Great for storing the pad and accessories. Sturdy metal construction. Buy this because it's great! 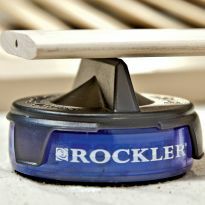 As you might expect from Rockler, it is a great product and it stores my master kit perfectly as it was designed. I imagine it will last as long as I will because of the quality of its manufacturing. Sturdy, holds the items it was designed to. I bought this on sale after I got the cookie set (also on sale). It is as described and I was most impressed with the gauge steel used in construction; this thing is heavy duty! The rubber material used for storing the risers is VERY dense and the fit is right on. I haven't had the cookies long, but I'm pretty sure I would have lost parts of the set by now if it weren't for this handy rack. Good investment and I definitely recommend. 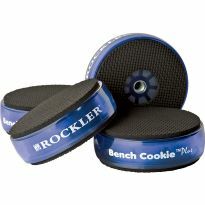 A must have if you buy the Bench cookie master set. Perfect place to store all of the pieces in one place. Excellent quality and workmanship. Perfect as a standalone on your workbench or hanging on the wall. Can't say enough about this piece. Well worth the money. Don't forget to buy the Master Cookie set to go with this storage center. this is the ideal item to have to store the grippers. Very useful storage for the bench cookies. You don't have to scrounge around looking for the bench cookies. Very sturdy! I holds everything in the kit , I have eight cookies and all the other parts at my finger tips and know that they are all stored together. It is so nice to have all these peices in one place and not have to go rooting around in the tool chest to collect the items I want to work with. It mounted over my workbench and is in arms reach when I'm ready to attack my T-track table. This product is exactly what I hoped it would be. 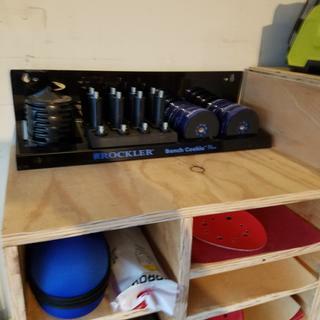 It keeps my Bench Cookie Master Set organized and easy to get to. No fumbling around and searching through drawers and cabinets. Perfect!!! I have two Bench Cookie Master sets which took up most of a drawer. Easy to find empty wall space for the storage center and now I have an extra drawer! This perfectly fits everything from the master kit and organizes it perfectly. Better quality than I expected, very pleases! Now a super value, if you have the master set and no where to keep them , this is the storage solution. Wanted stainless steel but then, this came out I love it. Holds everything in the master set. This thing keeps me more organized than a persnickety administrative assistant, and costs a whole lot less! 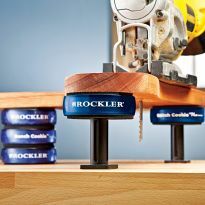 It delicately cradles each Rockler bench cookie with more care than the shiny ceramic bear housing chocolate chip cookies on the kitchen counter. Kinda wish it had a lid, though. Cookies don't look as nice when they're covered with sawdust. And when dipped in milk... Anyway, good product; glad I got it. It holds just about one of each possible rendition of the cookies. Great device. It will allow me to keep them stored to avoid clutter. A logical purchase to accompany the master kit. Neat storage for the bench cookie plus master kit. Seemed like a great way to store the cookies rather in a random box in my shop! Purchased a master kit and need to have storage. On my husband's Christmas list. I need them for the Bench Cookie master kit, and it was on sale. To keep all of the pieces together and neat. I have the parts and thought the storage center was a little to expensive to buy but it is currently on sale for ~$10 off so I figured I would go ahead rather than make something. 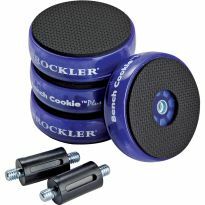 I purchased the Rockler Bench Cookie Deluxe set some time ago. I've been using it for over a year and always need a place to store these. When this came out, I knew it would be an excellent solution. TO ORGANIZE THE BENCH COOKIES I AM ORDERING And because on sale. I have a complete set of bench cookies, needed a better way to store everything instead of having parts throughout the drawer. Storage center will be the answer. Looking forward to getting Storage Center. To store my bench cookies. Had some extra money to burn. Was either buy this or diapers for my child, I chose this. To store my bench cookie master kit. I need to organize the clutter. I like to be organized and have readily available. 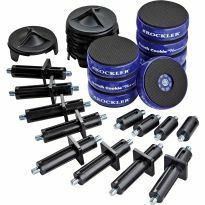 I just purchased the Bench Cookie Plus Master Kit and will need some place to store them when not in use. Attractive and functional storage center for the Bench Cookie Plus Master Kit! Keep the shop organized and looks good doing it! Wanted to add to my kit. what is kind of foam does is have in the center? BEST ANSWER: It seems to be a neoprene like foam... it works very well I have two of these units one on each door of a two door cabinet. 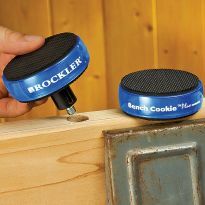 One has the "Bench-Cookie" brand the other the Rockler brand of "cookies." Both are loaded with the max amount of dogs and cookies as well as the fishing lifts that fit on the cookies. An excellent choice for storage of a product that is nice to keep at hand for working on many different steps of a project from assembly to finishing. It is a very rigid foam rubber. I have had my set for two years and have had no issues.